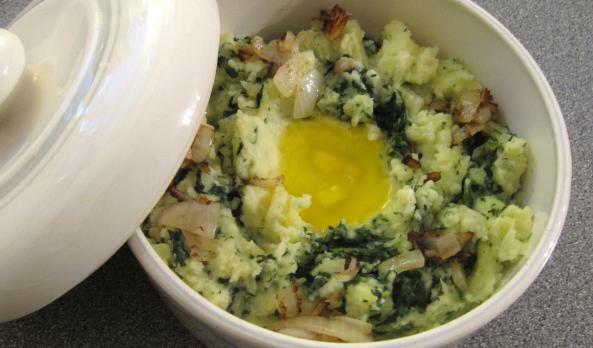 Colcannon (sometimes also spelled "colchannon") is probably the single traditional Irish dish that is eaten by the largest number of modern Irish people. but not overcooked. Drain very well. Meanwhile, cook the potatoes, and while they are cooking chop the leeks or onion tops and simmer them in milk or cream for about 7 minutes. Drain the potatoes, season and mash them well, then stir in the cooked leeks and milk, adding a little more milk if needed. Finally, blend in the finely chopped kale or cabbage. Add the pepper and salt and taste for seasoning. Heat the entire mixture gently, then pile in a warmed dish. Make a small well in the center and pour in the melted butter.